In this week’s edition of our newsletter, I want to show you how to aggressively trade Forex with a 20 pip profit target. This is a very reasonable target that occurs most days, day in and day out. The first thing I do is to go to ForexTicket.com to review which pairs are currently showing the most volatility. One of my preferred pairs for scalping is the British Pound / Yen (GBPJPY), especially at the 7:30am London open. By using my Hawkeye Gearbox indicator I can easily determine that currently, the best two time-frames to use are 162 ticks and 384 ticks. So, once I have these charts up, I add two of my indicators: Hawkeye Volume and Trend. Hawkeye Volume provides the green, red, and white bars on the price, showing me whether the market is being accumulated, distributed, or if there is no demand at all. This is an amazing leading indicator which literally signals a price movement prior to it happening! The Hawkeye Trend indicator are the dots which give me a clear indication of the market trend and momentum. First of all, I take a look at my Hawkeye Fatman indicator, displaying the Pound and the Yen at the same time, 7:30am in London. You can see they are in opposition to each other. The Pound being brown, and the magenta being the Yen. 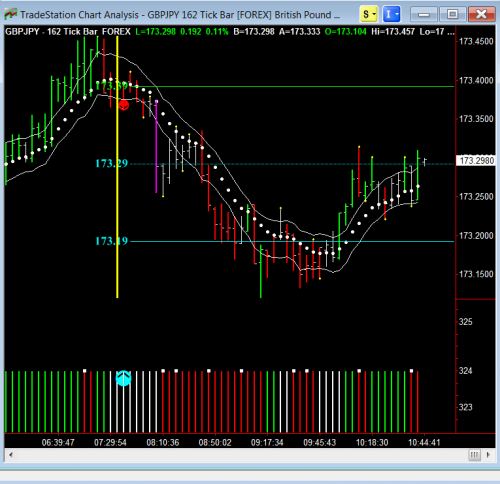 So, this is showing me straight-away that the Yen is showing strength against the Pound. I then go over to my charts and have a look at the double-time volume. 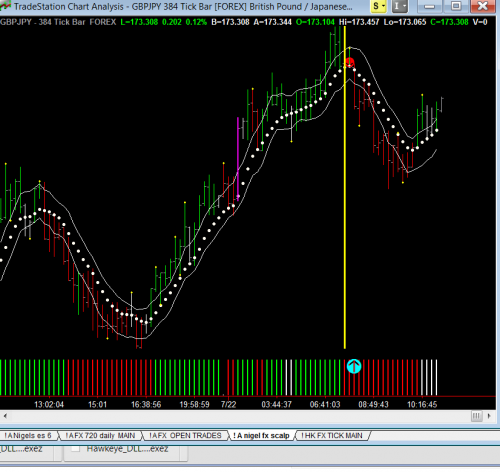 Double-time volume is on the bottom of the chart below with the cyan arrow. And you can see on the 384 tick chart (above), the double timeframe is showing me there’s red selling going on, and on the 162 tick chart (below), you can see that it’s neutral, which is just fine. It’s telling me that there is no defined direction yet on the double time frame. However, if you look at the Hawkeye Volume on the price, you can see that it has already turned red. But, the most important thing I’m looking at is the actual trend dot, and you can see that the trend dots, both on the 384 and the 162 chart have started to roll over and point downwards. So, with my volumes leading the way, showing me the bias is to the downside, I enter a short based on the 162 tick chart with confirmation from the 384 tick chart. And, as you can see, by putting the Hawkeye Grabba on (the horizontal lines), it comes down to the 173.19 area, hits 20 pips, and I take my profit. I’m done for the day with my scalp. Now, one of the things I try to teach is that it is far better to put a larger position on and go for a shorter trend run then it is to put a smaller position on and go for a longer trend run. And, if you can hit 20 pips, day in and day out, even on one contract, that will give you the confidence to scale up to 3, 5, 8, 10, or more. Then, you’re starting to make real capital wealth. One other thing I would like to emphasize is how I manage these scalps. Once prices have moved 10 ticks, I move my stop up to break even. Also, once prices get close to 20 ticks, I move my stop to lock in 10 ticks of profit. That way, I’m always taking money out of the market. So, I hope you have enjoyed this brief example of how to scalp aggressively. Thank you for this excellent example of aggressive scalping, as well as the informative website for determining Forex volatility! I also want to thank you for the unending and incredible job that you and your team provide for continuing education such as this article, long after the “software sale” has been completed. Your commitment to your clients’ success continuing “after the sale” is unprecedented in this industry. I am very grateful that you decided to share your software, knowledge, and methodology with us! God Bless! Thanks for that strategy. I would like to try it trading Binary Options. The difference with Binary Options is that one has to choose a predetermined length of time till the expiry of the contract. 5 min., 10 min.,15 min,.up to about an hour. Any suggestions there? Thanks again. I’m glad you find the strategy useful. Unfortunately, we don’t have any suggestions for binary options. Hello Bob, you may want to try the phoenix trading method using the he suite of indicators. Method developed by Bill Recardo at trading pub. Previous PostPrevious Want to profit from Volume? Here’s how.